To commemorate the centenary of the Great War, the diaries of 3,987 British soldiers have been digitized and made available online. They contain first-hand accounts of trench warfare, gas attacks — oh, and that time two cats and a dog were suspected of being spies. An intelligence report of the army's 12th division in northern France, dated 10 July 1915, records: "A brown paper kite was found on night 8/9th in front of the right section of our line … covered with German writing, of which the following is a rough translation: 'You can fill your trenches with devils – we Germans fear nothing in the world, and we Germans await victory … Englishmen, how badly you shoot! You will be served as the Russians'." The message added that while German soldiers had "wine, sausage and meat", the British were "hungry and thirsty". An intelligence report later that week reflects the eerie nervousness of the soldiers keeping watch at night and hearing every movement in the enemy trenches. "Two cats and a dog are under suspicion as they have been in the habit of crossing our trenches at night: steps are being taken to trap them if possible." Some of the war diaries are almost swashbuckling in tone. An account of an attack by the Indian army's Mhow Cavalry Brigade, on 1 December 1917 in northern France after promised tanks had failed to arrive, records: "Lieut Broadway had already killed two Germans with the sword when he was treacherously killed by a revolver shot by a German officer who raised one hand in token of surrender keeping the other behind his back. This German officer was immediately killed by a lance thrust from a man following Lieut Broadway." On the same day, a "patrol galloped up to the trench and crossed it, pretending not to see the Germans who let them go by. They then turned about and galloped back under heavy machine gun fire … Too much cannot be said of the spirit and conduct of all ranks of the Central India Horse throughout the day". David Langrish, records specialist for the National Archives, said in an interview that the document shows a heightened interest in intelligence and new forms of warfare on the Western Front. "The case of the dog and two cats, shows the level of suspicion amongst military units at this time," Langrish said. "Every detail was of potential importance for the planning of further operations, and so every possible suspicion would have been reported," Langrish said. "The war saw new weapons, new tactics and new methods of conducting warfare, some of which were unimaginable a few years before. While the report about the cats and dogs is a less serious example, it shows the very extreme experiences of time in the front lines." "It just goes to show the extent of concerns at that time," Simpson said. Read the rest at the Guardian and Toronto Star. 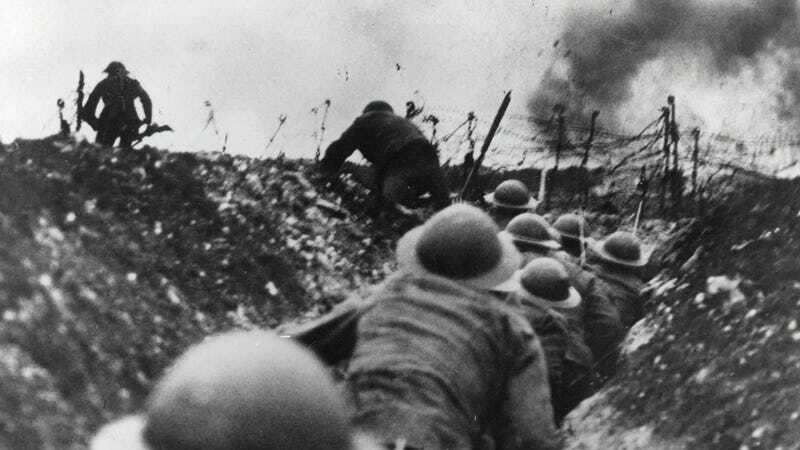 Image: British soliders go over the top at Battle of the Somme.